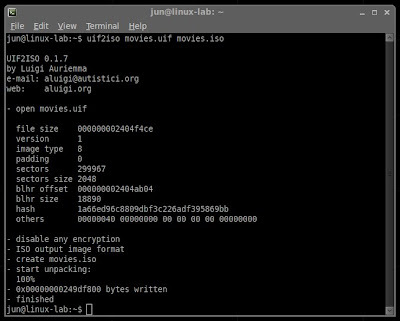 How to Open/Extract UIF Files in Ubuntu Linux: If you have downloaded a UIF (.uif) file and is wondering what it is or don't know how to open it when using Ubuntu Linux or any other distro, then read on. So what is UIF? UIF (Universal Image Format) is a compression image file format used by MagicISO that is primarily utilized to compress and backup a CD and DVD content. The advantage of using UIF file format is that it allows you to encrypt, password protect and compress cd or dvd content along with the ability to backup multiple session of CD/DVD, Audio-CD, VCD, SVCD and DVD-Video. 3. So after converting the UIF file to ISO, simply locate the output file (in my case movies.iso) using the file browser, right-click on it, and then extract. That's about it. It’s pretty easy, right? Thanks, i might need this later on. But i'm wondering if the .uif file was password protected, will i be asked by the uif2iso tool to enter the password, or will it bypass it? Worked well. Thanks for that. Thank's for the helpful guide! Hi, Thanks for your easy guide.